The angle of the back, as well as the curve along the back, make a huge difference in the comfort of the chair. Other things that make a difference to the comfort is the height of the arms as well as the slop and height of the seat. If you don't believe me, go to a store that sells a few different models and sit in them, you will be astounded at the difference in comfort from one to another. If you are short on storage place there are even some folding models. 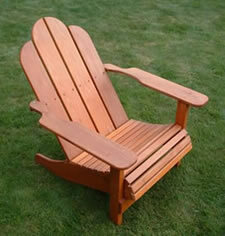 The plan I used was a very basic one, sadly I learned after the chairs were built what the term "comfortable Adirondack chair" means, but now that I know I am on a new quest to find or build a much more comfortable chair so that in the lazy days of summer I can sit in the shade sipping my lemonade in comfort.